Our curriculum has been carefully designed, planned and organised to ensure that our children’s needs are at the heart of our curriculum. 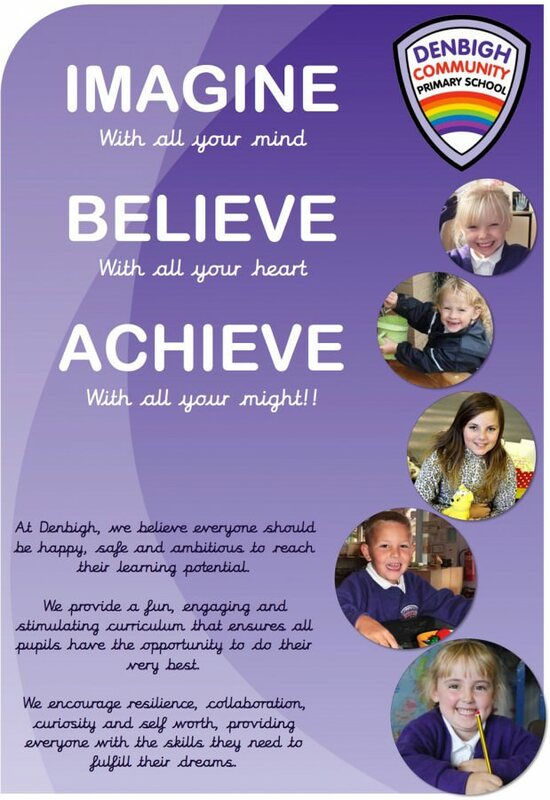 Denbigh’s curriculum is based on the fundamental principle that every child will achieve the highest possible outcomes in their academic and personal development. It is for this reason that we have developed our ‘CORE’ curriculum. When planning each topic/area, we start by looking at the standard we expect every child to achieve and what deep level learning looks like. Learning experiences are then planned to ensure that every child stands the best possible chance of achieving this. We believe that our curriculum and the use of our ‘CORE’ learning will not only provide our pupils with a knowledge and understanding of the National Curriculum but will deliver children with challenging, engaging and stimulating opportunities to apply their learning. Therefore, ensuring children deepen their knowledge and understanding. By creating a comprehensive and robust curriculum we can use a cross curricular approach to add depth and purpose to our learning. We expect the standards of our learning to be demonstrated equally across core (English, Maths and Science) and foundation subjects (Art, Computing, P.E, Design Technology, Geography, History, Music, R.E, P.S.H.E, M.F.L). Within foundation subjects, the main learning outcome must relate to the subject being studied but the children will have opportunities to apply their knowledge and understanding from core subjects. Having reviewed the needs of our children, we developed our C.O.R.E curriculum. The CORE curriculum ensures that all subjects are taught with the pupils needs in mind. Every subject must provide CORE learning. C – Communication (Opportunities for Speaking and Listening, Reading and Writing). O – Opportunities for Challenge (Effectively using data tracking to challenge pupils). R – Reasoning (Use and apply learning through logic, deduction and induction). E – Experiences (Provide meaningful, interactive learning opportunities). Our curriculum is designed to meet the needs of every pupil in our school. When designing our curriculum, we carefully look at the needs of every child/group and tailor the curriculum to deliver what best meets their needs and how they learn most effectively. Our careful curriculum design and planning means that we build in many opportunities for repetition and practise opportunities for essential knowledge, skills and understanding in every subject. This ensures that children are able to revisit previous learning, which allows them to gradually develop a deeper understanding of the skills and processes within subjects, at their own pace and in the best possible way for each individual child throughout their years at Denbigh.